Hi, devs, just thought I'd pass along this upcoming basic Neo4j webinar, in case you haven't yet drunk the Kool-Aid but feel thirsty. Happy New Year Graphistas! We have some exciting webinars planned for you this winter: here are a few coming up in January. 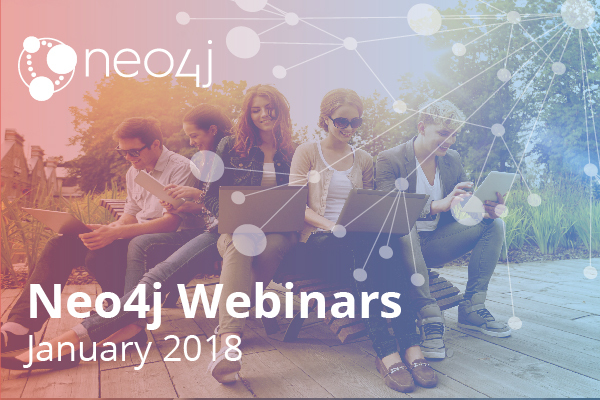 Be sure to keep an eye on neo4j.com/webinars for more upcoming webinars. Can't make the time but interested in the topic? Sign-up with your email and we will send you a recording afterward. This webinar will provide an introduction to Neo4j and Graph Databases. We'll discuss the primary use cases for Graph Databases and the properties of Neo4j which make those use cases possible. We'll then cover the high-level steps of modeling, importing, and querying your data using Cypher. We'll also touch on RDBMS to Graph. This past summer, Neo4j released its first set of graph algorithms designed to help organizations understand their graphs at a global level. This webinar will discuss the algorithms for community detection, centrality and path finding. These complement long-standing graph navigation and traversal functions of which Neo4j is known. This growing graph analytics library is sure to become a foundation for your data science and development work. This email was sent to [hidden email]. If you no longer wish to receive these emails you may unsubscribe at any time.